A small group of Pixel 2 owners were surprised to receive an unexpected second update this month. The new files weighed in at 41.8MB, and fixes critical bugs while improving the performance and stability of the model. The new build number was revised to OPM2.171019.016, which does not match the number seen on the Factory Images page for the Pixel 2. To deepen the mystery, Google did not issue a detailed changelist for the update. 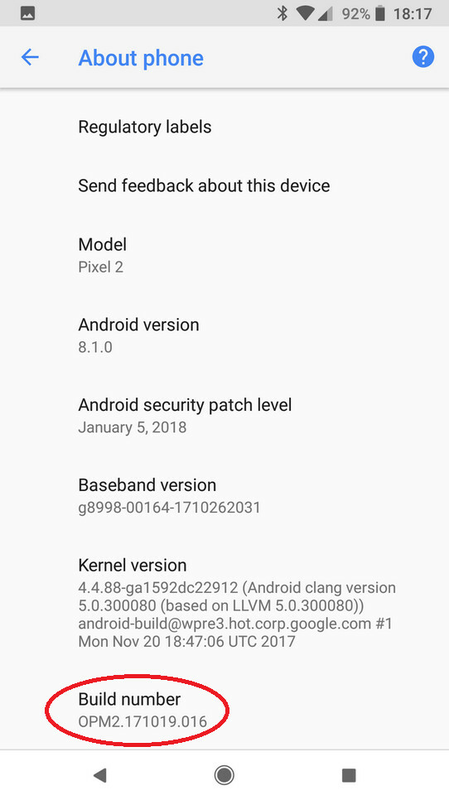 Google's MO with the Pixel has been to disseminate an update early each month that brings the latest Android security patch to the device, along with any bug fixes. There are reports from those Pixel 2 owners who installed the update, that a bug preventing Google Assistant from playing music stored on the phone has been exterminated. Another said that he can now use Google Home to shuffle his library of music following the installation of the update, which keeps Android 8.1 and the January security patch level on the phone. We hope to snag a comment from Google, and if there is some word out of Mountain View, you can be sure that we will pass it on to you as soon as we hear something. Did they fix the bug so that users can save contacts to device or still requiring people to save to Gmail..?